There’s an old wives’ tale that says if a bird won’t eat a fruit, it’s poisonous. As it turns out this tale is not true for many fruits, including Highbush cranberries. While these cranberries are edible, most birds and animals avoid them because they taste quite sour and they have a scent that is not appealing. Make no mistake, when you eat these berries raw, it tastes as though you are eating poisonous berries. Their flavour borders with disgusting but there are several things you can do to turn this negative into a positive. Real cranberries are in the Heath family. Highbush cranberries are in the Honeysuckle family, and are actually related to elderberries. 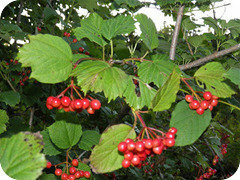 Highbush cranberry fruit (or drupes) grow on a deciduous shrub that can grow anywhere between 3 and 5 metres in height. The leaves are opposite, serrated, and tri-lobed, somewhat resembling those of a maple tree. Historically the bark of the Highbush cranberry has been used for menstrual cramps, which accounts for one of its common names, crampbark. In the spring, this shrub blossoms with bursts of white flowers, somewhat resembling hydrangeas with smaller flowers in the center, and larger sterile flowers bordering them in a ring. Highbush cranberry shrubs fruit in late summer, at first green then turning red. Each berry contains a single flat disk-shaped seed. These fruits can be harvested before or after a frost but they are softer and easier to work with after a good frost. Highbush cranberries are easy to pick and can easily be pulled from the shrubs without making a huge mess. I must say that Highbush cranberries are a food for creative culinary talents. If you want to walk on the edible wild side of life then you can use these cranberries with your Thanksgiving meal. Check out this Highbush Cranberry Sauce if you want to try it out this Thanksgiving. In addition to a sauce, you can use these fruits as you would with any other fruit to make jams and jellies as well. I want to know where I can find and pick these cranberries within about a 100 mile or 160 km radius of Calgary? They stink like feet but it makes a great tasting jelly that bares the same smell. Like Christmas in november,thank you again. I have eaten them in small quantities – although I urge you to do some research as I haven’t a definitive answer to your question. In a saucepan, combine sugar and Corn Starch. Add the cranberries, orange juice and butter. Cook and stir until mixture comes to a boil. Cook a few minutes longer or until thickened and bubbly. Cool before putting tart shells (which I buy). I’m in Winnipeg. My parents had high bush cranberries at one of their homes and I can still remember picking them for my Mom to make jelly. They certainly had a “strong scent” when ripe and were very easy to pick late in the fall. As mentioned in this article, one of the great things about the berries is that you are not fighting Mother Nature when you pick them. ie: no bears, birds, squirrels. However, aphids seemed to love them when they were ripe. I picked a few gallons of highbush cranberries a few days ago.Early September. Makes awesome jelly! My mother used to make a sauce from th Highbush Cranberries. We would pour it onto pancakes, then cream and sprinkle with sugar. It was delicious!